Probably not the most exciting post, and not one you were expecting, but an important post nonetheless. I love showers, much more than baths if I'm honest. Showers get me up in the morning, they make me feel clean and fresh and full of vitality...healthy. But what if they aren't actually that healthy? This is something I've been thinking on for a while whether to write about or not. The topic first crept into my mind when I desperately needed a shower curtain replacement in my flat. I popped to the local shop and ended up with a choice between a garish patterned affaire that cost as much as a cinema trip for two or a plain white one that was cheap as chips. Obviously I scooped up the latter and thought to myself 'cheap and cheerful, it'll do!' Then I got it home and whipped open the packet, immediately I was assailed with a slap in the face wave of plastic stink and it set alarm bells clanging in the back of my mind. As you can imagine, that smell is quite the indicator of things not being at all that healthy. Reason being was this shower curtain was made from pure PVC (Polyvinyl chloride). PVC is one of the most toxic plastics out there, and this innocent looking but deathly stinking PVC shower curtain was off-gassing up a storm in my bathroom. I did a bit of research on this and everywhere you get the same scary figures. My one little curtain could have been off-gassing up to 108 different chemicals or VOCs (volatile organic compounds), some of which are classed as unsafe at certain levels in indoor spaces and most of which can stick around for up to a month! Oh and some of those chemicals, such as this old nut which we've all come across before - Phthalates - well they can be release even more in warm conditions. I'm betting that like me you like your showers hot rather than cold? Yah. Hemp // While not at all waterproof, hemp is said to be both quick drying and have it's own natural anti-mildew properties. It's also able to be grown organically and is considered very eco-friendly. Sounds swell! The problem... cripplingly expensive. We're talking about £60 for a shower curtain people - not to mention hard to find! Cotton // Cotton seems like the next best alternative, best if you opt for an organic one. Cotton doesn't have the benefits of being mildew resistant but that can be tackled with frequent washing. Depending on the thickness, this would effect the drying time as obviously again this would not be water-resistant. Again we're looking at a steep price tag and limits availability. Linen // This one runs along the same lines as cotton but also has the typical crumpled effect that linen takes on after the merest of movement. Again expensive and hard to source. Polyester // This is the option that I settled for. Not the most toxic-free option but nowhere nearly as nail bitingly bad as PVC. Polyester is obviously a form of plastic, but it doesn't off-gass and doesn't contain chlorine etc. It isn't waterproof but dries in a flash. It's easy to wipe down and rinse in the washing machine to tackle mildew and mould. Nylon // Pretty much on the same level as Polyester, however it tends to absorb more water and take longer to dry out. Also sometimes they may be treated with water repellant chemicals to counteract this which may lead to more VOCs. PEVA/EVA // The least favourable of all the options as again these are made from petrochemicals (polyethylene vinyl acetate and ethylene vinyl acetate) and they can still produce a bit of off-gassing. However they are chlorine-free which makes them better than PVC as the off-gassing is considerably reduced. Out of cost limits and availability I've made sure that I've got a polyester shower curtain. While not the best option it still means I can rest a little easier knowing that I'm not filling my tiny flat with all sorts of unknown chemicals. Personally I would ideally like a glass door shower but considering I'm renting and don't have this option, this is the best option for now. 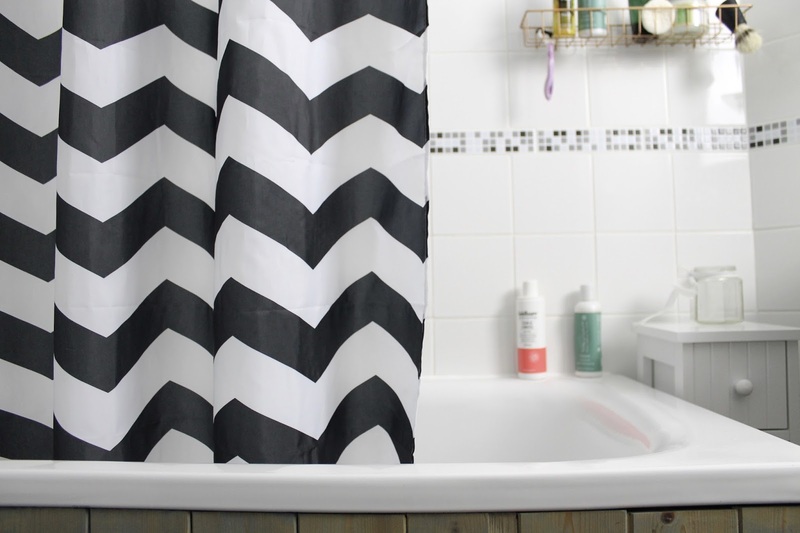 Will you be checking your shower curtain next time you pop into your bathroom? I actually found this really interesting.. luckily for me I have glass! OMG! I haven't realised until reading you. My curtains are like yours, similar paint and material.